UCSD stunned Cal State Stanislaus 1–0 in the semifinal matchup of the California Collegiate Athletic Association Tournament on Friday, Nov. 4. Sophomore forward Mary Reilly struck a goal with less than two minutes left to give the Tritons the 1–0 lead at Warrior Stadium. 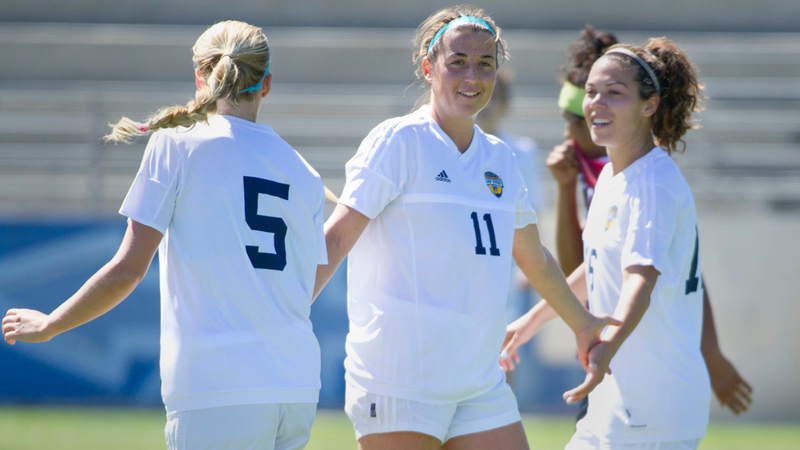 On Oct. 21, UCSD defeated Cal State Stanislaus in a previous game this season 3–0. Stanislaus fared much better in the rematch. However, the Tritons have beaten the Warriors four straight times in a row. The clock was running out of time, and overtime seemed on the horizon before Reilly saved top-seeded UCSD. Co-captain and senior center back Meghan Berry cleared the ball to junior winger Jordyn McNutt. She then passed to senior midfielder Jamie Benedetto, who headed the ball into the penalty area where Reilly was in perfect position to tap in her 11th goal in the 89th minute. Benedetto and McNutt were awarded with their second and 10th assists, respectively. Freshman midfielder Roni Merrill came off the bench and had two left-footed shots in the first period, one that was caught by sophomore goalie Haley Crook and another that was too high. In the 57th minute, Reilly and junior forward Katie O’Laughlin almost came together for a goal, but O’Laughlin’s attempt went wide left. Redshirt senior goalkeeper Itzel Gonzalez only needed one save to earn a league-leading 14th clean sheet. On the other side, Crook stopped four shots. The Tritons held a 14–4 shot advantage, with an 8–1 lead in the second half. Reilly had more shots than Cal State Stanislaus by herself, 6–4. The Tritons, the previous CCAA Tournament winners, moved on to the school’s 10th final against No. 6 seed Cal State Los Angeles on Sunday. The Golden Eagles defeated second-seeded Sonoma State because of a penalty kick after 110 minutes of scoreless action. UCSD shut out Cal State LA, 2–0, at home in a regular season matchup on Oct. 14. The Tritons scored two early goals to beat Cal State LA in the 2016 CCAA Tournament final on Sunday at Warrior Stadium. The Tritons had already won the CCAA regular season title, earned the tournament title and raised their record to an impressive 18–2 and are on a 15-game winning streak. UCSD defended its title from 2015 and have 10 tourney titles. The tournament win also gives it an automatic bid in the 2016 NCAA Championship. UCSD didn’t wait long before scoring, unlike their last match, as the first strike occurred in the sixth minute. Junior left back Aimee Ellis passed a deep ball from left to right to McNutt. Redshirt senior midfielder Kiera Bocchino attacked the left post and fired a volley into an empty net for her eighth goal of 2016. Bocchino, who was dealing with food poisoning, scored what would be the game-winner. A little later in the first half, junior midfielder Elisa Martinez gave the Tritons a two-goal lead after a deflection off of a defender. Gonzalez finished with a save to earn a league-best 15th shutout. The other goalkeeper, sophomore Adriana Maldonado, had five saves in the match. In total UCSD had a 16–6 shot advantage. Berry, the senior co-captain, was named the CCAA Tournament Most Valuable Player and Reilly earned Most Valuable Offensive Player honors. Gonzalez, Benedetto and redshirt freshman midfielder Natalie Saddic were named to the All-Tournament Team. No. 6 seeded Cal State LA finished its season with a 7–9–4 record. Berry had an injury through the weekend, but was a key part for UCSD pitching two shutouts in the CCAA Tournament and assisted the game winner by Reilly against Sonoma State. These accomplishments allowed her to win Best Player of the Tournament. The Tritons will now wait for the official announcement for the 2016 NCAA Championship, which fields 48 teams. A selection show will air live on NCAA.com at 3 p.m. In all likelihood, UCSD will host a portion of the NCAA West Regional next week. Check UCSDtritons.com for more details.